There would be four Easter eggs sitting on the wall…….. Yesterday we made Easter bonnets. The children have been invited to make hats for three of the groups that we attend. We made a simple cardboard hat and created a chick. Its body was an egg shape and the children’s handprint formed the chicken’s wings. We decorated them with feathers too. The baby loved the sensory experience of playing with the feathers. I’m now on the lookout for a feather boa for her to play with. Photos of the finished bonnets can be found on my Facebook page. Its Mother’s Day this weekend. 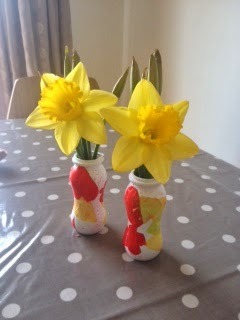 The older children decorated a little vase for their Mummies which they filled with daffodils. Labels: Arts and Crafts, Easter, Newsletter items for parents of children in my care.